LulzBot Mini Review - Does the LulzBot Mini Pack Enough Punch? LulzBot Mini Review – Does the LulzBot Mini Pack Enough Punch? The LulzBot brand of printers are easily my favorite 3D printing company right now. I don’t say this easily. I like a lot of what’s happening in this space, but LulzBot has something special going for it. The company behind LulzBot is Aleph Objects Inc., billed as a open source hardware company. In fact, you’ll find references to “open source” communities and software littered across their site. That’s what makes the LulzBot so fun. It’s supported by a company that supports the industry as a whole and doesn’t get territorial about their profits or knowledge. 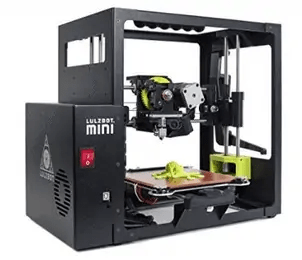 Having already highlighted the LulzBut Taz 4 as the “Best 3D Printer for Experimenters” (see full article here), I was super excited to get my hands on the LulzBot Mini. It’s marketed as a more refined and consumer oriented printer, that takes direct (if friendly) aim at the Da Vinci, UP! Mini, and Solidoodle desktop printers. “Open Source” is always a great idea in theory, but sometimes they end up in partially executed end products that have “too much” of a DIY feel. With this in mind, I was curious to see what kind of alterations and strides LulzBot has made with their “mini” model offering. The following is my full review of LulzBot Mini and everything it has to offer. Compatible With Many Filament Types: LulzBot is all about adding new compatible materials! Some systems only let you select from 1 or 2 material types and even then, force you to buy their own “branded” material. Not the LulzBot! This is one of the most “material friendly” machines I’ve handled. The standard ABS and PLA will work great, but also, HIPS, PVA, PETG, Nylon, Polycarbonate, and many other wood and metal filled filaments. They add more to the compatibility list on a regular basis, too! Compact Design: The “Mini” version of the LulzBot is designed as the prototypical “desktop” 3D printer. It’s small enough in stature to sit comfortable on a desk or workbench, but not too small to render the build area non-functional. If you are researching the Mini, then you are probably not looking for a hulking machine. The overall dimensions are 17.1 x 13.4 x 15.2 inches. Heated Print Surface: Originally, many 3D printers did not come with a heated print bed. This led to problems where the printed material wouldn’t stay fixed in position. For precise projects, this can be a deal breaker. Thankfully, many companies have taken notes. The LulzBot Mini comes standard with a PEI heated print bed that keeps this in place without any additional treatments or adhesive materials. Plug and Play Functionality: The LulzBot Mini is easy to set up and start using immediately. No need to put anything together or work through complicated assembly manuals. Open Source Design and Software: Aleph Objects is dedicated to the open source 3D printing and software community. As such, the LulzBot Mini is basically an open book. You are free to download any software, experiment with filament types, and tinker with the machine. This is in stark contrast to some of the 3D companies that are fiercely proprietary and protective of their systems and technology. The following are some of the key things that I like about the LulzBot Mini. Easy to Set Up: The LulzBot Mini has a nice mix of experimental design with practical ease of use. It’s literally plug and play. All you have to do is unpack the machine, install the software and connect the power/usb cables. There’s no finicky alignment required (many 3D printers require a lengthy process of calibrating the extruder). Low Misprint Rate: This is a precise machine. In my experimentation, I did not experience any misprints or quality control issues related to the printing mechanics. This really signifies just how polished this desktop printer is. Heated Print Bed: This is an underrated feature. As discussed under the “features” section, this is pretty much a necessity to avoid quality control issues. Open Source Software: The folks behind the LulzBot are firm supporters of the open source community. This means that the LulzBot is compatible with a variety of open source programs. However, if you are looking for a highly tailored experience, the Cura 3D printing software has a specific design for LulzBot and can be downloaded for free. It’s compatible with Mac, PC, and Linux machines. I really like this combination of flexibility while still allowing for a smooth out of the box software system, if desired. There were a few items that I wasn’t so excited about. I’ve listed them below. Open Frame: Normally I really like the open concept, but novice users should be aware that this increases the risk of heat/burn injuries (usually from the hot extruder). If you aren’t used to this, it’s important to be prepared. Another downside of the “open” concept is that the printer can give off odors (depending on the print material) during the print process. Comes with Minimal Print Material: Some printers come with a hefty starter kit of print filament. This is not the case with the LulzBot Mini. You’ll probably want to invest in some additional filament to fully test out the Mini when it ships. Not the Cheapest: The LulzBot Mini isn’t the most expensive 3D printer (list price is around $1350 here). Other “starter” 3D printers can be had for as little as $500, but these are not necessarily the same quality or reliability of machine. The LulzBot Mini might not be the cheapest “mini” desktop printer, but it is one of the best in terms of reliability and flexibility. The Mini printer is among my favorite printers and I can thoroughly endorse it as a good starter options. For larger projects, you’ll obviously want a larger print area but for small-scale printing the Mini is perfect. Overall, even the “cons” are not really deal-breakers. To check out the latest pricing details, check out this listing.